with a larger healthcare system. healthcare facility and provides a variety of inpatient and outpatient services. economic viability, and provide for the security of the DeKalb Health team members. DeKalb Health, located in Auburn, Indiana and DeKalb County, opened its doors in 1964 as DeKalb Memorial Hospital, thanks to the voluntary contributions of the citizens of DeKalb County. The independent, not-for-profit, acute care facility, features a wide variety of inpatient and outpatient services. 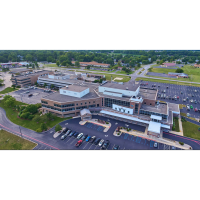 It has achieved many milestones along the way, including the opening of Emergency Medical Services addition in 1975 and the completion of a three-story medical building in 1992. In the last decade, numerous expansions and renovations have brought the facilities up to date, and in May 2008 the Surgical Center began welcoming patients. Comprehensive renovations to the Emergency, Imaging and Diagnostic Centers were completed in 2011. Additional renovations to Rehabilitation, Orthopedics and Business Health and the privatization of all patient rooms and were completed in 2015.
healthcare organization of choice for patients, physicians, payors and healthcare professionals.” To learn more, visit dekalbhealth.com or follow us on social media.